The man’s 20 year old son had fallen from a four foot stepladder and hit his head. The surgery required was so risky that the father had to sign a release to allow the surgeons to try it. Thankfully, he made a full recovery, but it was a long, painful and costly rehab process. The ladder was too short, so the son stood on the top cap and then over-reached, causing the ladder to tip. 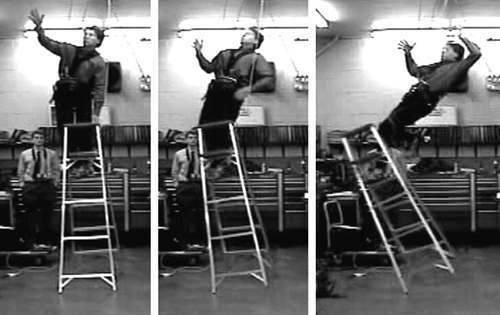 His feet fell the same way the ladder fell, but the rest of him fell went to the side with the ladder causing him to land on his head.The son had had several larger ladders available, but he chose to carry the smaller ladder because it was lighter. Choosing the lightest ladder, regardless of whether or not it is fit for the job, is a common issue on just about every job site. Once workers realize the ladder they have is too short, they rarely go back and get the taller ladder. Workers climb on the top rung or the top cap of the ladder to gain extra height, leaving them nothing to hold on to. Now that you know workers are likely to use the wrong ladder, what are you going to do? The most important thing is to train employees on the importance of choosing the right ladder. The next step is to enforce this ruleby correcting employees when you see them using the ladder incorrectly. Little Giant has worked to design a ladder that should reduce these types of accidents. The Select Step is a six foot A-frame ladder that adjusts to be a seven, eight, nine or ten foot ladder. The SafeFrame is another great ladder without the top cap to prevent these types of injuries. How will you encourage ladder safety?